industrial component supplies ltd supply a complete range of Power Transmission Products. We are able to replace your existing parts or design a complete drive system. We supply quality products from the majority of leading manufacturers. Comprehensive stocks of Roller Chain, Sprockets, Plate Wheels, Weld on Hubs, Pulleys, Taper Lock Bushes, Drive Belts and Shaft Couplings and Fenalex Tyre Couplings are carried in stock. Products that are not available from stock are usually despatched the same day from UK sources for next day delivery, collection or direct despatch. Its that simple - its your choice ! 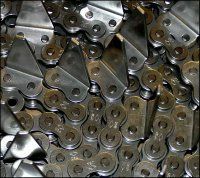 Renold will now produce standard attachment chain ready for despatch within 72 hours. This service covers half-inch (08B) to one-inch pitch (16B) transmission chain with standard K attachments, M attachments and extended pins for standard carbon steel BS chain. Regina Group is a world leading developer and manufacturer of power transmission chains and related power transmission devices and components. Thanks to its long-standing technical knowledge, manufacturing know-how and highly diversified product range, the Group is able to offer reliable solutions to a widespread global portfolio of end markets. Megadyne are one of the highest quality Belt and Pulley manufacturers in Europe and the World. Manufacturing products that include Vee Belts, PV Ribbed Vee Belts, Isoran Synchronous Belts, Megaflat (PU & Rubber endless flat belts), Megapower (PU endless Timing Belts), Megalinear (PU open ended Timing Belt), Megaflex (PUR truly endless Timing Belts - special lengths on request), Megarib (PU endless Megarib Belts). As well as the above Manufacturers, ICS are able to supply from a range of other manufactures including Cross & Morse, Kobo, Sedis & Rexnord. Please contact us for requirements, FREE quotations or any further details.